Magnetic levitation is well known, but acoustic levitation’s progress has been slow, though highly significant. So how far can we exploit sound waves to make objects float on air? When you sleep, your brain processes sounds that you unconsciously hear. Indeed, even as you sleep, sound remains important; think of smoke alarms or ‘wake-up to drink coffee and go to work’ alarms. And this is only the beginning of the story. You sleep. Science does not. A team of scientists at the University of Sao Paulo in Brazil, led by Marco Aurelio Brizzotti Andrade, has refined a technology that uses sound waves to allow objects to float in mid-air. Most of the time, they levitate blobs of Styrofoam. The Sao Paulo researchers’ breakthrough not only floats objects in air, which scientists have been doing pretty much consistently since 1940 using more standard technology, but it also allows objects to float irrespective of exactly where the device generating the ultrasonic frequency is moved to (provided, of course, that it is somewhere in the locality). The formal definition of ‘levitation’ is ‘the process by which an object is held aloft, without mechanical support, in a stable position’. Rather than floating on water then, levitation occurs when an object is floating on air. This is a wonderful inversion of how we normally think about things. Air is experienced as a cushion, rather than an invisible, non-corporeal substance that we cannot interact with because it doesn’t seem to quite be there. Levitation has usually, so far, been accomplished through the use of magnets. Robert Goddard, a pioneer in the field of rocket science, published a 1904 paper proposing that trains be fitted with super-magnets, levitating them above the track in order to reduce friction. He was only taken mildly seriously. It wasn’t until the 1940s, and British engineer Eric Laithwaite’s contributions, that we began to see some industrial application of magnetic levitation technology. To accomplish levitation with magnets, however, the object being levitated needs to be susceptible to magnetism in the first place. That narrows down the range of objects that can be levitated, of course, to metals. Nevertheless, the levitation principle underlying maglev trains has made mass transport quicker and more efficient, by more or less eliminating friction and wear and tear on moving parts. Sound is a wave. Waves generate pressure. This pressure compresses air. If you compress air at the correct frequency, it is possible to float an object on the cushion of compressed air; using a standing wave allows us to control and exploit these compressions. A standing wave occurs when two waves interact and interfere to produce a third wave that oscillates but does not travel. The points of zero amplitude, the nodes, are at fixed positions. A popular example is a stretched elastic band being plucked. If you stare closely at the vigorously vibrating rubber band, you will notice it looks like three bands: one at the top, one at the bottom, and one in the middle. The middle image is the standing wave. The wave has two fixed parts (where the elastic band is attached) and an oscillating part in the centre where the reflections from each end are interfering with each other. To apply that to acoustic levitation, we need to introduce and explain two other terms: compression and rarefaction. While compression involves an area of increased pressure, rarefaction is its opposite; an area of decreased pressure. Think of this as something approaching a vacuum. Sound waves are capable of producing both areas of rarefaction and compression. When two sound waves, each producing two areas of compression, align, we get a standing wave that can be used for acoustic levitation. The object we intend to levitate can be rested on the air that we’re super-compressing with sound. The levitating object is floating on sound waves. Or, to be precise, is floating on air compressed by a sonically produced standing wave. 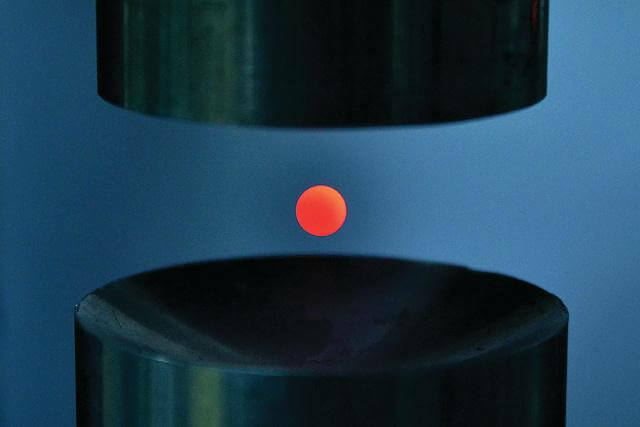 Scientists have created an environment for the levitating object, where the pressure above the object is less than the pressure below it, causing it to rise up. Rhett Allain, associate professor of physics at Southeastern Louisiana University, and Wiredmagazine’s resident scientist, says this environment creates ‘net upward force’ because the air below the object is being highly compressed by the sound wave. In this field of research, progress has been slow but highly significant. To give one example of a huge scientific advance, for many years it required an immense amount of calculation to get the standing wave just right. Objects generating the sound wave were placed above other objects generating other waves. Back in the early stages, scientists were required to employ at least 130 acoustic emitters to match their calculations and generate the desired waves. The levitating object in those days had to be placed in the centre, where it was calculated that the standing wave would be generated. This was known as resonant acoustic levitation; ‘resonant’ because of the calculation of resonance necessary to generate sufficient pressure for levitation. In order to lessen the expense of the technology, scientists discovered that, rather than have an array of acoustic emitters, they could use one emitter and a reflector. The emitter creates a wave, which is then reflected; carried out correctly, the wave and its reflection create a standing wave which can be used to achieve levitation. Modern acoustic levitation technologies rely on this development, which has cut the number of emitters necessary from 130 to just two. Use of resonance technologies, however, still left the problem of fixed distances, which placed limits on both the scope and application of levitation techniques. Imagine, for instance, if you could only see the picture on your television screen at a fixed distance from it. Andrade’s recent breakthrough obviates the fixed distance requirement. With non-resonant acoustic levitation, we no longer need to be concerned with fixed objects and distances in order to maintain the levitation. Which brings us to one of the few limitations left: weight. Although scientists have levitated animals (including mice, frogs, and insects), metals, liquids, and all manner of chemicals, using various available methods, acoustic levitation in particular remains hampered by weight. Andrade explains that acoustic levitation can be divided into two types: ‘standing wave’ and ‘near field’. In the former, small particles are levitated at the pressure nodes of a standing wave. In near field acoustic levitation, he says, planar objects can be levitated less than one millimetre height from a vibrating surface. Acoustic levitation of very heavy objects has been performed only in near field acoustic levitation. The fertile imaginations of the most creative science fiction writers would be at a loss to come up with the totality of possible applications for this new technology. Applications, industrial and commercial alike, appear to be limitless. Already a Chinese research group, for instance, is mass-producing Bluetooth speakers that levitate in order to evenly distribute bass throughout a room.